We are living in a New Normal world. Populists such as Nigel Farage, Donald Trump, Marine le Pen and Beppe Grillo are gaining support as economic growth slows and social/political unrest becomes common. My presentation at our annual conference last week in Vienna highlighted some of the key issues, as Jessie Waldheim of ICIS news reports. VIENNA (ICIS)–Markets face a period of increased volatility as political and demographic changes result in a paradigm shift from globalisation to sustainability as the driver for chemical markets, the chairman of consultancy International eChem said on Tuesday. In 1987, then US president Ronald Reagan stood in front of the Berlin Wall in Germany and demanded that it be torn down. In 2017, US president-elect Donald Trump is expected to build a wall. In Europe, the Brexit vote for the UK to leave the EU and the upcoming referendum in Italy could cause further turmoil for the EU. These political changes are being driven by demographic changes which are also going to effect petrochemical and other markets. Essentially, as life expectancies have increased and birth rates have lowered, a larger percentage of populations are older. For example, as the second chart shows, the number of US households in the 25-54 age bracket has been steady while the number in the 55-and-up age bracket has risen by nearly 50%. 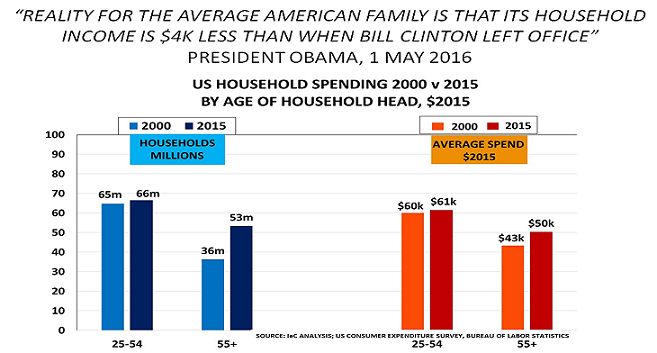 The older households tend to spend less money, having already made most major purchases. This is in contrast to recent decades, when major population growth in the younger age brackets drove global demand. ”We don’t have lots of young people, so you don’t need as much stuff,” Hodges said, speaking at the 15th annual World Aromatics & Derivatives Conference in Vienna, Austria. According to figures from the American Chemistry Council, we’re seeing a drop-off in capacity utilisation, which is the “best single predictor we have” of global GDP, Hodges said. With the capacity utilisation numbers in September 2016 nearly as low as in 2009, we’re likely to see a global recession next year, he added. Our economy has not yet adapted to the new demographics. This adaptation will mean uncertainty and political risk. ”We’re seeing the rise of protectionism. Sustainability is replacing globalisation,” Hodges said. Trump has said he has plans to declare China a currency manipulator and to withdraw from or renegotiate trade deals. The Brexit vote is part of this same paradigm shift. “We need to be planning for this,” Hodges said. Companies will need to consider how trade flows will change with China no longer the major importer and manufacturing capital of the world. And companies will need to consider inter-polymer competition from lower polypropylene prices. Businesses models will have to change and restructuring will be inevitable. Key chemical hubs will have to be made more robust, and being near customers may become more important, Hodges said. With the change comes opportunities. For instance, businesses could focus on designing solutions with new materials or by repurposing materials already in the market. “Aging populations are an opportunity. Why are we not developing new services and products for them?” Hodges said.